4Br/2Ba- Cabin on Lake Blue Ridge sleeps 8, private dock, wood burning fireplace, hot tub, pool table, and a screened porch! Starting at $185 a night! Deepwater Lodge is a four bedroom, two bath cabin with a private dock on Lake Blue Ridge. On the main level you will find a Queen size bed, a second bedroom with a futon complete with small TV just perfect for children, a full bath, fully equipped kitchen, dining area, and living room with a flat screen TV and a wood burning fireplace (firewood is supplied). Glass doors open onto a screened porch, and second set of glass doors open onto an open deck. The game room is on the lower level with a pool table, flat screen TV, two bar tables, full bath, and two bedrooms with Queen size beds. Glass doors open onto a patio with private hot tub. Additional amenities include WiFi, washer/dryer, and central heating and air conditioning.PLEASE NOTE: Upstairs bedroom TV and downstairs TV are piggy backed, therefore you must watch the same channels. Parking is limited to no more than three vehicles. If bringing boat, boat trailer will need to be dropped at Lake Blue Ridge Marina. 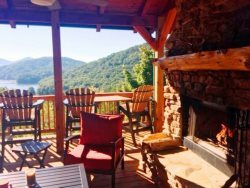 Nearby attractions include hiking the beautiful trails of North Georgia, biking, Antique Shopping, White Water Rafting, Horseback Riding, Scenic Train Rides and the famous Swan Drive In. All of our cabins include linens, dishes, pots, pans, towels, washcloths, etc... We will provide an initial supply of guest soaps, toilet paper, dishwasher detergent, paper towels and trash bags. We suggest that you bring your supplies for an extended stay of paper towels, trash bags, starter logs for wood burning heater and laundry detergent. We had a WONDERFUL time!!! Everyone in the office was fantastic and great to work with from the initial call to the maintenance call. Everyone was very friendly, we were treated like we were the only ones. We are already discussing and planning our next stay. There are so many things to do within an hours drive. The scenery is breathtaking. You are out in the woods but still not far from town.We have already recommended it to our family and friends.This was a family vacation for Thanksgiving. There were 8 of us and a baby and there was plenty of room for all of us. Everyone was pleasant, friendly and helpful. The cabin was nicely decorated. The kitchen was well stocked with plates, cups, etc. We enjoyed using the pool table more than we thought. I was going back and forth between cabins all over North Georgia, so I called your company many times. Every time I called, your staff was awesome. I couldn't remember the cabin name I was looking at, but with a little description, your staff was able to find it again out of all of your cabins. They were very friendly. I would absolutely stay at this cabin again, or any of your cabins. Affordable and beautiful. My friends and I hadn't seen each other in more than 2 years, and your company helped make it awesome. I had a girls weekend with college friends coming from all over the united states and some of us arrived earlier than check in so the cleaning crew were still on sight. They were so nice and let us put our bags on the porch while they finished up. They let us unload cars even while they were still there. they were very nice and helpful. I love deep water lodge! The kitchen is big enough to have three chefs all getting dinner ready. The bedrooms were spacious and cozy at the same time. I love the flow of the house with the den, tv and screened in porch and deck all together. Easy to come in from the lake with chairs, coolers ect. right by the kitchen on the deck so there is no mess inside. I love the table outside on the screened in porch to eat at, plus a table inside. We fed so many and had a place to sit. The house is so close to Toccoa River Restaurant and the Blue Ridge downtown area of shopping and restaurants. The closets had extra quilts and blankets to make our stay perfect on cool nights. I love the cabin feel and just overall hospitality of this cabin! Will definitely come back to Deep Water Lodge!!! Mountain Laurel Cabin Rentals are always a pleasure to work with. We can count on homes to be comfortable and clean. Any issues that arise are always dealt with in a timely, friendly, helpful manner.